Walton began with Cleator Moor before joining West Stanley in August 1919. He had an outstanding season with the club in the 1919-20 season, when the club finished a mediocre twelfth gaining 31 points from 34 games. However they did excel in the F.A. Cup which saw them dispose of NE League side Leadgate Park 2-0 in the fifth qualifying round home tie and then, once more with ground advantage a 1-0 win saw them reach the First Round proper with a win over Second Division Rotherham County. Southern League Gillingham were the opposition when they progressed further after they were 3-1 winners at home and Jimmy Walton scored one of the goals. Now into the final thirty-two of the competition, they were pitted against Tottenham Hotspur, runaway leaders of the Second Division at White Hart Lane, where they eventually succumbed 4-0. Leeds recruited him from the North-Eastern amateur club, and he signed for United on 21st May 1920, at the age of twenty two, but his arrival was overshadowed by that of Jim Baker, who arrived as a much more high profile acquisition on the same day. None-the-less he was left-half in United’s first-ever game in the Football League at Port Vale on 28th August 1920, and he made the position his own as he missed only one game in United’s first season in the Football League and scored one of the goals that saw Leeds triumph in their eighth League game in a 2-0 home win over Blackpool on 2nd October 1920. 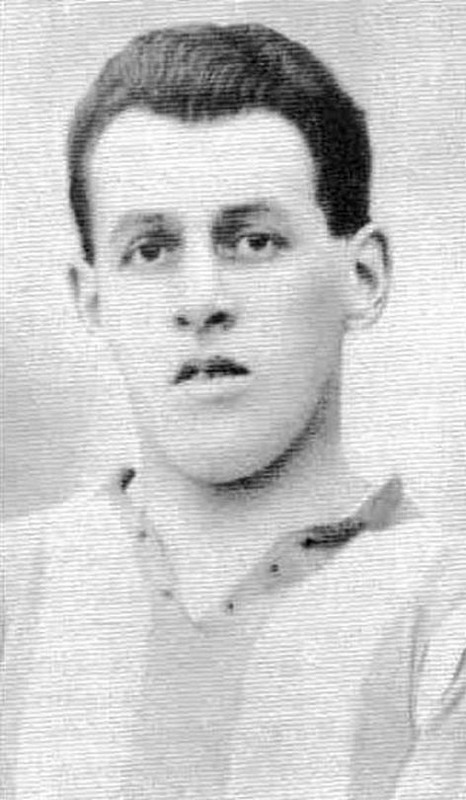 He kept his left half spot for the first eleven League games in the 1921-22 season, but with captain Jim Baker, Harry Sherwin, who had been signed from Sunderland at the start of the new season, and the emerging Ernie Hart fighting for the three half back spots, it was Walton that gave way with Jim Baker taking on the left-half spot, with Sherwin on the right and Hart in the centre. He missed the next seven games. However, with Sherwin and Hart unavailable, Baker took on the central role with Tom Gascoigne and Walton on the right and left for the next three games. After that he could not get back in favour and only played twice at left half and once at right half in the league and once at left half in the F.A. Cup. He scored once, the second Leeds goal in the opening fixture at home to Port Vale on 27th August 1921, and started seventeen times in the League and once in the Cup, but in the second half of the season the half back line of Sherwin-Hart-Baker prevailed. He never played another first-team game at half-back for Leeds. The 1922-23 season saw him miss the first four games but then played twice at inside right when Bill Poyntz was out, scoring once, with the first goal in the home game with Stockport on 9th September 1922. After that he was Jack Swan's replacement at inside left in nine consecutive League and one Cup game from late November to early January, when Swan reclaimed his place. In that period he scored his second goal of the season, the only goal in the game at home to Wolves on 2nd December 1922. The Cup game at Portsmouth on 13th January 1923 was his last game for Leeds. He left Leeds at the end of the season, signing for Bristol Rovers in August 1923. He was a regular with Bristol, scoring at Exeter City and playing forty of the forty-two matches, together with the two F.A. Cup games against Exeter City. A disagreement saw him leave the club after the end of the season and he was transferred to Brentford for £125 in November 1924 after not playing for the Pirates in 1924-25 season. He played on a regular basis with the Bees, making fifty-nine appearances, without scoring before leaving in June 1926. He then joined Hartlepools United and made his debut on 30th October 1926 in the Third Division North match at Rotherham United as a left half with Robert Thompson, an ex-Leeds teammate, at centre forward and played his final game a week later at home to Bradford Park Avenue, again at left half with Robert Thompson leading the attack and also, another ex Leeds teammate, Bert Duffield, at right back. He died in Trafford, Manchester, in August 1989.